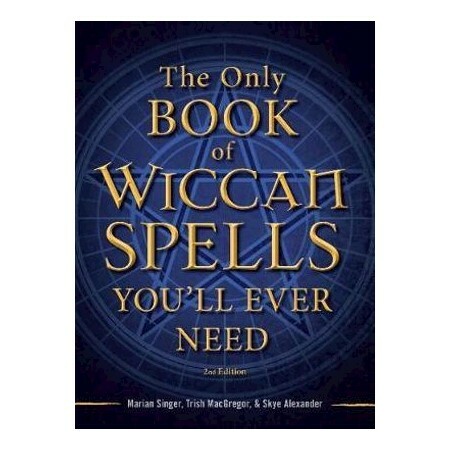 "The Only Wiccan Spell Book You'll Ever Need, 2nd Edition", by noted Wiccan authorities Marian Singer, Trish MacGregor, and Skye Alexander, is the perfect primer to understanding the basics of Wiccan philosophy and ideology. Starting with a brief rundown of Witchcraft tools and symbols, this handy reference helps readers create spells for virtually every aspect of their life. This new edition includes up-to-date information on: The Wheel of the Year: the eight major holidays or sabbats in the witches' calendar; Keeping a grimoire or "Book of Shadows"; Meditation, visualization, and manifestation (law of attraction); Magickal correspondences and properties of stones, magickal jewelry; Spirit Animals and Totems; and, How to join or create a coven. Filled with more than 100 spells, simple instructions, and recipes that incorporate easy-to-find ingredients, "The Only Wiccan Spell Book You'll Ever Need, 2nd Edition" will have beginner witches creating their own magick in no time. AUTHORS: Marion Singer is an expert on Wicca, witchcraft, and goddess traditions. Trish McGregor is the author of The Everything Astrology Book and the Everything Dreams Book. Skye Alexander is the author of more than a dozen nonfiction and fiction books including The Everything Wicca and Witchcraft Book 2nd edition and the Everything Spells and Charms Book 2nd edition.